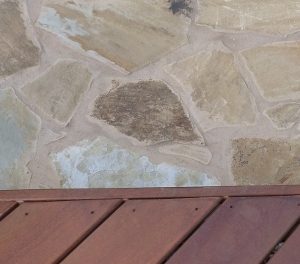 If you live in the Austin area, you’ll see flagstone patios everywhere. They’re tremendously popular in this area for several reasons. First, they’re very attractive and have a very natural look which compliments that Austin landscape. The stone has a nice rustic feel and also adds subtle depth and texture to your patio. Cement patios are also very popular right now with stain & stamp and stain & score. All of these concrete styles are very nice but just have a different feel. The feel of the stained concrete will depend largely on the stain color. Darker colors may often look more formal. There are hundreds of patterns and textures you can achieve with stain and stamp. In this scenario, the concrete is stamped to add a pattern that’s either just attractive to look at or a pattern designed to mimic a more natural look – perhaps the look of natural stone. When looking at flagstone, it’s a great way to finish an existing cement patio or a great finish for a new patio you’re building. With our Archadeck customers, it’s always a popular request. We mainly work with flagstone from Oklahoma, Arizona and Mexico. 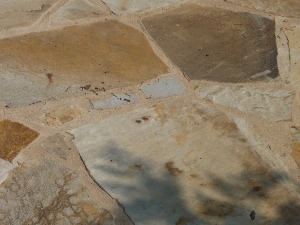 The Oklahoma Buff Peach is one of our favorite flagstones to work with. The flagstone surface tends to be a smoother and flatter finish than some of the other Oklahomas – not as much undulation. The colors tend to blend with pretty much anything. The top surface tends to also be more consistent. This is important when looking at flagstone. Some of the other colors or varieties can have a more undulating surface which looks beautiful and natural but can be tougher to put your furniture on. Of, if you use it for the top of your bar, it may be tougher to place table settings on. Some of the other Oklahoma flagstone colors we work with are Arizona Taupe which is similar to Oklahoma Buff Peach but is a little more subtle with all the shades leaning more toward the taupe hues. We also work with Oklahoma Silver Mist flagstone. It also is more subtle because the hues of the various stones all lean more toward gray. But in both the Oklahoma Silver Mist and Oklahoma taupe, you still have that nice unique variety of colors that complement each other and make your patio interesting and one-of-a-kind. We like to think that all of our project are one-of-a-kind from a design perspective. And, in reality they are. We never use the same project design twice. Every single customer gets their own rendering, their own architectural plans, and more. Every back yard is different and every family is different in terms of how they want to live in their back yard. What’s nice about flagstone is that every patio is one-of-a-kind. Flagstone is 100% natural and cut from the earth. It is not manufactured so no two stones are completely alike. So not only will the design of your project be one-of-a-kind, but your patio colors and stones are also. Oklahoma Buff Peach is tremendously popular as I said above. We probably use this more than the other colors. The colors in this group are very subtle and pleasing but they also have enough variety to be interesting and unique. The hues include subtle peach tones, subtle taupe tones and even some subtle gray tones. Here are some pictures from our actual patios to show you the interesting color variations of the natural stone. Perhaps it’s because this patio above adjoins a richly colored Tigerwood deck, the variation from this stone lot looks more subtle than the next two pictures. This patio above uses the same flagstone color and you can see a more chocolate shade and darker taupes in addition to a lighter, whiter shade. In this picture above, there are a bunch of more shades toward the taupe end of the spectrum as well as some darker peach hues. Here’s another Oklahoma Chocolate Gold patio that’s screened in with some detail about flagstone finishes. You can tell I am passionate about building with flagstone. Let me know if you have any questions about flagstone. Either use the comments section here, give me a call (512) 259 – 8282 or drop me an email wvann@archadeck.net. This entry was posted on December 1, 2010 by 33social. It was filed under Flagstone, Flagstone Patios, Oklahoma Buff Peach Flagstone, Oklahoma Chocolate Gold, Patios and was tagged with Archadeck of Austin, Austin covered patio, Austin deck builder, Austin flagstone patio, Austin Oklahoma Buff Peach flagstone patio, Austin tiger wood decks, Oklahoma chocolate gold flagstone patio.